While they have an obscure origin, carrots have become a mainstay vegetable for many of us. 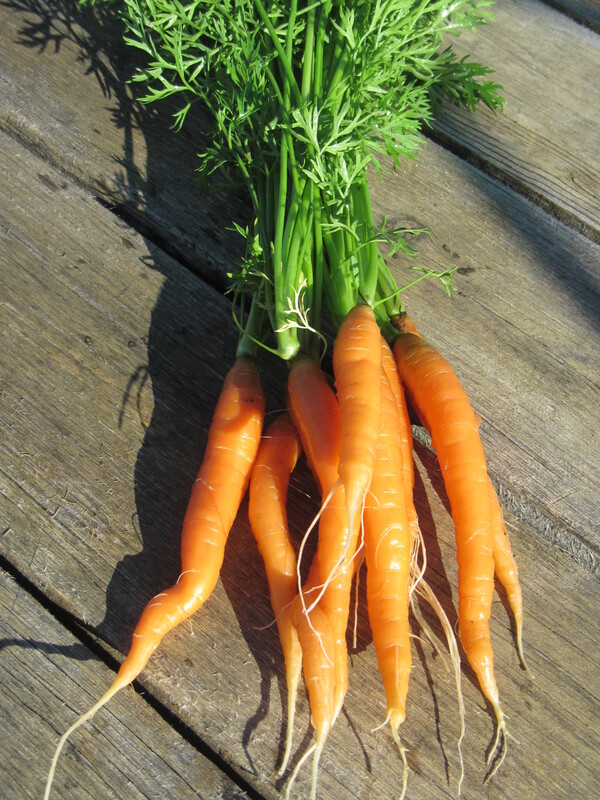 Naturally high in sugar, orange carrots also become a great source of vitamin A (due to the presence of carotene). The trick to preserving the freshness of carrot roots is to minimize the amount of moisture they lose. Thick cored carrots store the best. First remove the greens, since they draw away moisture from the root. Tightly seal unwashed carrots in a plastic bag in the coolest part refrigerator. Wash just before using, since the added moisture in the bag could cause spoilage. Carrots begin to go limp once exposed to air. Depending on how fresh your carrots are they should last about 10 days and probably longer. Some people recommend that you should line the vegetable drawer at the bottom of the fridge with a thick layer of absorbant kitchen paper. This will keep the carrots fresher for a much longer time. Make sure the carrots are dry before putting them in the fridge, especially if you buy them in plastic bags. Check on the paper once or twice per week. If it’s damp then line it with dry paper and you can just dry out the old paper and use it again next time. No need to throw it away each time. Carrots give off a lot of moisture in the fridge and it’s important to keep them dry. During the first five months of storage, carrots will actually increase their Vitamin A content; and, if protected from heat or light, can hold their nutrient content for another two or three months. The crisp texture of carrots is the result of the cell walls being stiffened with the indigestible food fibres cellulose, hemicellulose, and lignin. Perhaps the best way to enjoy freshly picked carrots is to eat them raw, or simply steam or boil them. For tender, young carrots, just scrub them well before taking either approach. Larger carrots, can have a tough skin and have too strong a flavour. Try to resist peeling as much of the goodness is in the skin. If cooking carrots, try to cut into even sized pieces so they cook at the same rate. Carrots pair well with thyme, chervil, dill, cumin, ginger, mint, sesame seeds, chili, mustard, honey, butter, olive oil, and sesame oils.